Just In: Audio Equipment Needing Love! 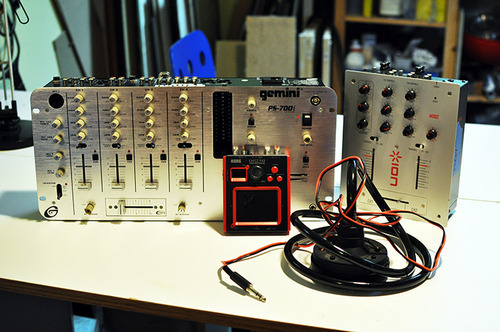 an Ion iMX02 mixer. The crossfade is a little fuzzy, but the panel cover can be unscrewed, and the crossfade can easily be cleaned or replaced. a Gemini PS-700i 4-channel mixer. The balanced output doesn’t work but is probably fixable, and the booth output works fine. a mini-KP Kaoss Pad for special effects processing. The plastic covering on the touchpad is dented, but slap new plastic on it and it should be good as new. a DIY talkbox, looks brand new and never used. I recommend looking carefully at the wiring and the jack— the person who dropped it off had never used it, so we cannot vouch for it. Stop by the shop any day, noon to midnight, to check out the new toys and make us an offer!